For the similarly named Texan county, see Coke County, Texas. "Cooke County" redirects here. For Cook County, see Cook County (disambiguation). 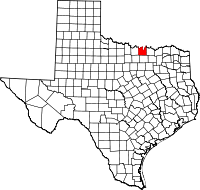 Cooke County is a county in the U.S. state of Texas. At the 2010 census, its population was 38,437. The county seat is Gainesville. The county was founded in 1848 and organized the next year. It is named for William Gordon Cooke, a soldier during the Texas Revolution. It is a part of the Texoma region. Cooke County comprises the Gainesville, TX Micropolitan Statistical Area, which is also included in the Dallas–Fort Worth, TX-OK Combined Statistical Area. Republican Drew Springer, Jr., a businessman from Muenster, has represented Cooke County in the Texas House of Representatives since January 2013. According to the U.S. Census Bureau, the county has an area of 898 square miles (2,330 km2), of which 875 square miles (2,270 km2) is land and 24 square miles (62 km2) (2.6%) is covered by water. According to statistical data from 2016, Cooke County has a population of 39,141 people (41% urban, 59% rural), nearly 14,000 households, and over 10,000 families. The population density was 42 per square mile (16/km²). The 15,061 housing units averaged 17 per square mile (7/km²). The racial makeup of the county was 88.84% White, 3.06% Black or African American, 1.00% Native American, 0.34% Asian, 0.01% Pacific Islander, 5.16% from other races, and 1.61% from two or more races. About 10% of the population was Hispanic or Latino of any race. Of the more than 14,000 households in Cooke County, 33.90% had children under the age of 18 living in the home, 59.60% were married couples living together, 9.90% had a female householder with no husband present, and 26.70% were not families; 23.30% of all households were made up of individuals, and 11.10% had someone living alone who was 65 years of age or older. The average household size was 2.60 and the average family size was 3.07. The population was distributed as 27.30% under the age of 18, 8.70% from 18 to 24, 26.10% from 25 to 44, 23.00% from 45 to 64, and 14.90% who were 65 years of age or older. The median age was 37 years. For every 100 females, there were 97.40 males. For every 100 females age 18 and over, there were 92.80 males. While 2015 estimates place the median household income for Cooke County at $53,552, past estimates showed the median household income to be $37,649, with the median family income being $44,869. Males had a median income of $32,429 and females $22,065. The per capita income was $17,889. About 10.90% of families and 14.10% of the population were below the poverty line, including 19.80% of those under age 18 and 10.70% of those age 65 or over. Median house values in 2015 were $118,254. The Texas Juvenile Justice Department operates the Gainesville State School in an unincorporated area in Cooke County, east of Gainesville. ^ "Gainesville State School Archived 2011-02-20 at the Wayback Machine." Texas Youth Commission. Retrieved August 8, 2010.